The hotel Crowne Plaza Lille with futuristic design, combines top of the range comfort and services. 121 bright, air conditioned and spacious rooms with panoramic view. Set in the heart of Lille and its business district, the situation of the Crowne Plaza Lille hotel is ideal, central and very convenient. Feet away from the TGV and Eurostar train stations, gare Lille Flandres and gare Lille Europe, with easy access the the main highways leading to Paris, Reims, Brussels, Dunkerque, Calais, but still within walking distance to the shopping area and close to a new entertainment place with the opening casino. The concert hall Zenith Arena and the convention center Lille Grand Palais are just few steps away from the Lille Hotel. 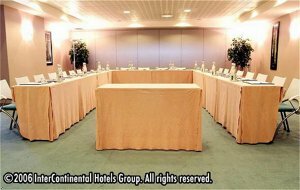 You will have direct access to the International World Trade Center adjacent to the Crowne Plaza Lille Hotel. Within the elegant surroundings of the restaurant Le Plaza, you will appreciate creative and refined cooking, buffet, brunch or a la carte service. The Crowne Plaza Lille hotel offers you additional facilities including a fitness centre, business centre, 5 meeting rooms and parking. The Crowne Plaza Lille hotel is an ideal choice.